In Week 10, Matt Schaub failed to reach the century mark in the passing yards category. Just a week later, Schaub surpassed five centuries worth of passing yardage. I’d be surprised to find a more dramatic swing from one week to the next at the quarterback position. In one game, Schaub raised his average yards per game from 223 to 254. And it’s not like this happened during Week 2. It’s Week 11 – the guy has played 10 games this season! As I mentioned yesterday, the fantasy world just seemed backward in Week 11. Arian Foster didn’t score, Chad Henne was a top-5 play and a dude with the first name “T.Y.” had 100 yards receiving and two touchdowns. And because of these unique surprises, there are plenty numbers stemming from Week 11 that made me raise my eyebrows. Matt Schaub threw for 308 more passing yards than Drew Brees. Much of this had to do with the fact the Texans played nearly 5 quarters of football. A lot of it, too, had to do with the fact that the Texans couldn’t do much on the ground. Chad Henne averaged over 22 yards per completed pass. Henne was an absolute machine on Sunday. He was money in leagues that give additional points to big plays. Tony Romo, facing the Browns, was sacked more than any other quarterback. The Cowboys came into the season with offensive line problems, and it showed Sunday against the Browns. Romo was sacked 7 times. Robert Griffin III threw only one incomplete pass. It only took 15 pass attempts for RGIII to throw four touchdown passes. Oh, and he rushed for 82 more. 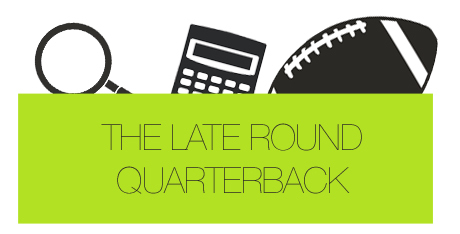 Can you say late-round quarterback? Carson Palmer finished 9th in Week 11 pass attempts. I think the majority of people thought he’d lead the league in pass attempts against the Saints, but the game went in a slightly different direction. Arian Foster had the 28th best yard per carry average amongst running backs. It was clear that the Jaguars game plan was to stop Foster, but it allowed Matt Schaub to do some crazy things through the air. Don’t panic if you’re a Foster owner. Trent Richardson led all running backs in receiving targets with 8. Richardson gets Oakland and Kansas City after this week’s matchup versus Pittsburgh. He could be a great back to have to make that playoff push. The top three scoring running backs – Marcel Reece, LaRod Stephens-Howling and Bilal Powell – all had an average draft position of nothing before the season started. Stephens-Howling is still a risky start, and Bilal Powell is obviously nothing more than a deep bench stash. But Marcel Reece, as I noted yesterday, is a legit fantasy starter with McFadden out of the lineup. There were only four running backs with 100 or more yards. Compare this to just a week earlier, where 6 running backs hit the century mark. And two weeks ago, 10 guys got to the milestone. Andre Johnson had one more target than Reggie Wayne, but accumulated 7 more receptions and 201 more receiving yards. Johnson’s big play ability against the Jaguars showed us all that he still has elite talent left in him. If the Texans continue to be forced to pass it, Johnson should continue to be a top-level start. Week 11 receivers with two touchdown grabs: TY Hilton, Danario Alexander, Brandon Gibson and Lance Moore. How many of those guys did you draft in the first 7 or 8 rounds? Justin Blackmon had the fourth most targets at wide receiver with 13. Many have been asking if Blackmon is worth a pickup, and my simple answer is yes. However, given the way he’s performed and the way rookie receivers perform in general, I would not trust Blackmon whatsoever moving forward. Danario Alexander had 5 more targets than Malcom Floyd. If his knees can hold up, Alexander will be a better option than Floyd for the rest of the season given Floyd draws coverage from opposing team’s top corner. An example of this was this past weekend against the Broncos, where Champ Bailey shadowed him most of the game. Denarius Moore caught one pass on 7 targets. It was a very disappointing game for Moore owners, as many thought he’d at least get garbage time points. I still look at him as a WR2 in most league formats. Anquan Boldin was targeted 12 times, while Torrey Smith was targeted just 7 times. The common trend appears to be that second wide receivers facing the Steelers will see more targets. However, keep your expectations in check, as the Steelers have been dominant against the pass, allowing zero touchdowns through the air over the last 15 quarters. Dwayne Allen and Dallas Clark led all tight ends with 11 targets. Allen was no surprise, considering the Patriots can’t stop opposing tight ends, but Dallas Clark’s 11 targets were. The position, as I’ve noted many times in the past, is a weekly matchup play. Garrett Graham and Owen Daniels each had 9 targets for the Texans. Graham, however, scored twice. Graham’s touchdowns were a result of Arian Foster not being able to get in the end zone, so I wouldn’t look much into them. Daniels is easily still the guy to own on Houston. Four tight ends caught multiple touchdowns in Week 11. The only draftable one of these tight ends was Rob Gronkowski. I can’t say it enough: The tight end position is becoming more and more important to scoring touchdowns, but you have to realize that all tight ends are performing well. It’s similar to the late-round quarterback strategy and philosophy. Carson Palmer has the most attempts (220), yards (1,601) and interceptions (8) over the last 5 weeks. Yet, there are two quarterbacks, Drew Brees and Josh Freeman, who have thrown for more touchdown passes over this time span. Over the last two games played, Robert Griffin III has more rushing yards than Shonn Greene and Stevan Ridley. Ridley’s rushing total is at 126 yards, while Green sits at 122. RGIII, on the other hand, has rushed for 137 yards. Over the last three weeks, with 13 less attempts, Doug Martin has 167 rushing yards more than Arian Foster. Alright, maybe we can credit some of this to his 251 yard destruction against the Raiders a few weeks back, but Doug Martin is…the man. Marcel Reece has 23 targets over the last 3 weeks. That’s 6 more than any other running back. Let me mention this again: Marcel Reece is legit with Darren McFadden sidelined. BenJarvus Green-Ellis is 6th in the NFL in rushing attempts and 20th in running back fantasy points. Does it get any more mediocre than The Law Firm? Only Jimmy Graham and Rob Gronkowski have more fantasy points at the tight end position than Brandon Myers over the last 5 weeks. Myers has a good matchup this week against Cincinnati, as well. Like all tight ends, he’s a matchup play, but he should absolutely be rostered in your fantasy league. No defense has more sacks over the last 5 weeks than the Denver Broncos. Given the Broncos schedule, they’re a great addition to your fantasy team if they’re somehow still out there. What’s interesting, too, is that the Browns and Saints are tied for third in sacks over this time span. Cecil Shorts is 7th in the NFL in targets over the past 5 weeks. It’s tough to trust Shorts because he’s in such a bad offense, but the numbers don’t lie. Shorts is a startable wide receiver in fantasy. Randall Cobb leads all receivers with 6 touchdowns over the last 5 weeks. A must start, Cobb is becoming one of the most reliable fantasy plays at the receiver position.